Banners 1 and 2 are priced at $349 per month, and they could have a rotation of up to three banners at the same time. We can link any of them either to your website, amazon or any online store, or a Promo Page created by us with promotional info about the artist, band, CD release or event. We offer a three-month banner campaign for the discounted price of $299.00 per month (any banner). Ad #3 is the SOUNCLOUD TRACK OF THE WEEK. Price: $99.00 (per week). Includes promotion on all media properties, including: Facebook, Twitter, Google+ and Soundcloud. We also offer a Free Download for Radio Show Hosts through our Jazz Global Media Soundcloud account. The Promo Page is priced at a one-time fee of $249.00. It is permanent however the client can request periodic updates for a small fee. Also, it includes bio, photos, promotional quotes, links to websites, social media, amazon or any online store and one soundcloud track, one youtube video, one photo and one promotional poster provided by the client, or designed by us for a fee to be negotiated. Established in 2000, Latin Jazz Network built its reputation on providing Latin Jazz and Jazz aficionados with reputable, in-depth, up-to-the-minute news, reviews, interviews, feature articles, concerts, and events. Latin Jazz Network prides itself on presenting and promoting the artistry of emerging and established talent and providing readers with exclusive, behind-the-scenes information you won’t find anywhere else. 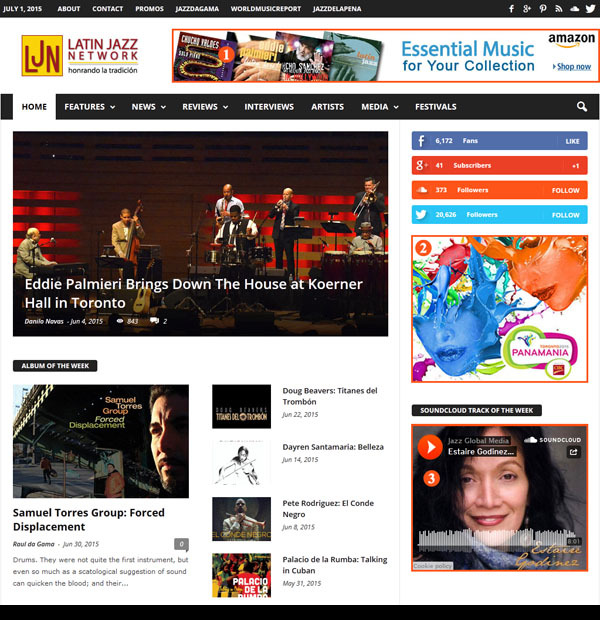 Latin Jazz Network currently boasts a readership of more than 60,000 monthly views, a social media network of more than 30,000 followers and a mailing list of 3000 plus subscribers. In addition, Latin Jazz Network recently joined forces with JazzdaGama and World Music Report, for a combined readership of more than 100,000 monthly views, a social media following of 75,000 and a mailing list of 3,000+ subscribers. Latin Jazz Network, JazzdaGama and World Music Report are your one-stop destination for all matters pertaining to Jazz, Latin Jazz, World Music and emerging and established artists.